Is Google encrypted keyword data impeding your SEO? 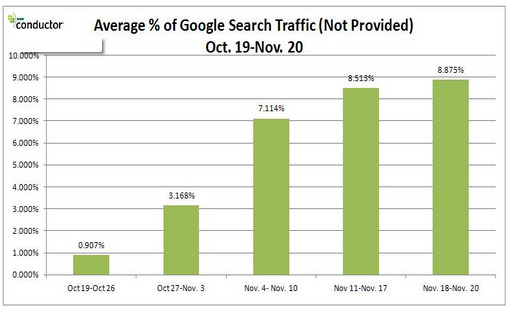 Although distinguished search engineer Matt Cutts assured marketers only a single-digit amount of keyword referral data would be impacted by the update, some sites have reported more than 10 percent of their traffic is now attributed to (not provided) referrals. Rand Fishkin of SEOmoz reported earlier this month that the average of 60 sites’ analytics data translated into 12 percent (not provided) search referral data. Conductor has taken an average of several different reports to show the growth in keyword referral data that is (not provided). According to its estimates, from October 19 to November 20, the amount of hidden data has jumped from 0.907 percent to 8.875 percent. Content writers can continue to focus on the top performing keywords among the available data, and this may be a prime time for businesses at a loss for data to go for long tail keywords. 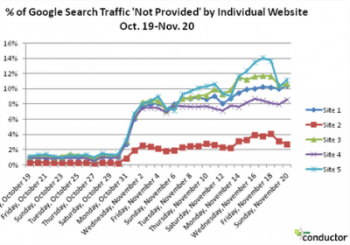 Reports indicate that long tail phrases comprise 70 percent of all organic queries.